Our delectable range of products provide you with a wide variety of options from curries and soups to dals and desserts, so you can say goodbye to being bored with what’s in your lunch box. Plus if you’re looking to branch out from what comes in the pack, we have a collection of recipes that you can try. Eating out at lunch time can really take it’s toll on your bank balance. Look after your wallet by having a stash of our MTR products in your desk drawers. Our authentic Indian recipes have been honed by culinary experts over eight decades. The result: wholesome, tasty and high quality vegetarian food. So wrap your taste-buds around our tempting selection of treats that are produced from the purest and best quality natural ingredients, using traditional methods of preparation. When it’s cold and wet outside, there’s nothing quite like a hot lunch to warm you right up. For those that like a bit of spice in their life, our range covers mild, medium and hot levels of spice. Many of you will be all too familiar with the concept of having to eat your lunch whilst at your desk due to a myriad of meetings or a pile of paperwork. Thankfully MTR Foods Ready To Eat range can be microwaved on high power for just 2 or 3 minutes. If your workplace doesn’t have a microwave, never fear, our products can be heated by immersing the unopened pouch in boiling water for about 5 minutes. So there you have it, five great reasons as to why you should stock up on our range of Ready To Eat meals for your work lunches. Enjoy! Look out for our range of MTR Foods products in your local supermarket. Usually our delicious selection can be found in the “Gluten free” or “International” sections. Coarsely grate the carrots. 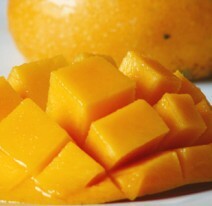 Cube the mango. Mix the carrots, mango, sweet red pepper and finely sliced red onion in a wide salad bowl. To make the dressing, place all the ingredients in a screw top jar and shake well until thoroughly mixed. Pour the dressing over the salad and toss well to coat the salad evenly. Just before serving, toss the salad lightly and sprinkle with snipped chives and toasted sesame seeds. Serve immediately. Food Fit for a Feast! Each of MTR’s Ready to Eat meals is designed to serve two people when served with a side of rice or chapattis or your favourite carbohydrate. You can easily transform a meal in a hurry for two into a feast for four or more. Start with your choice of soup – use two packs if you are feeding four people. 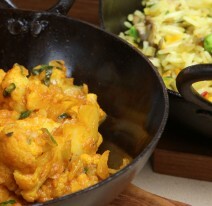 Then choose a high protein, filling meal like our Chana Masala (chickpeas in gravy) or Dal Makhani (black lentils and kidney beans), along with one or two of the vegetable dishes like the Alu Methi (potatoes with fenugreek) and your favourite rice dish – perhaps the Jeera Rice with the aromatic flavour of cumin. All of that takes only minutes to heat and serve, and you have a feast for less than $15.00. Keeping a good supply of Ready to Eat meals in your pantry means you are never short of a tasty, nutritious and easy to prepare meal with that authentic Indian flavour. Increasing numbers of kiwis are finding they need to turn to a gluten-free diet for themselves or their families. Often the challenge for people needing to go gluten-free is the relatively small range of options, particularly if they are also looking for food that is healthy and possible even vegetarian. 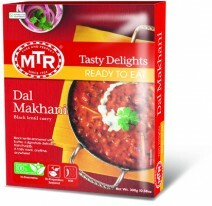 A number of products in the MTR Ready to Eat range sold through supermarkets around New Zealand are gluten-free, including the popular Dal Makhani, Dal Fry (with yellow lentils) and Palak Paneer. We have made it easy for you to find the gluten free products on our site, by adding all of them to a gluten free category. Some New World supermarkets even have the MTR gluten free products sitting in their Gluten Free section, right next to the International Foods, making them even easier to find than usual. Keeping some packs in your pantry means that you always have a very affordable, convenient and quick gluten free option to call on when required.